This game was designed to occupy one evening when we had only the GM plus three players. 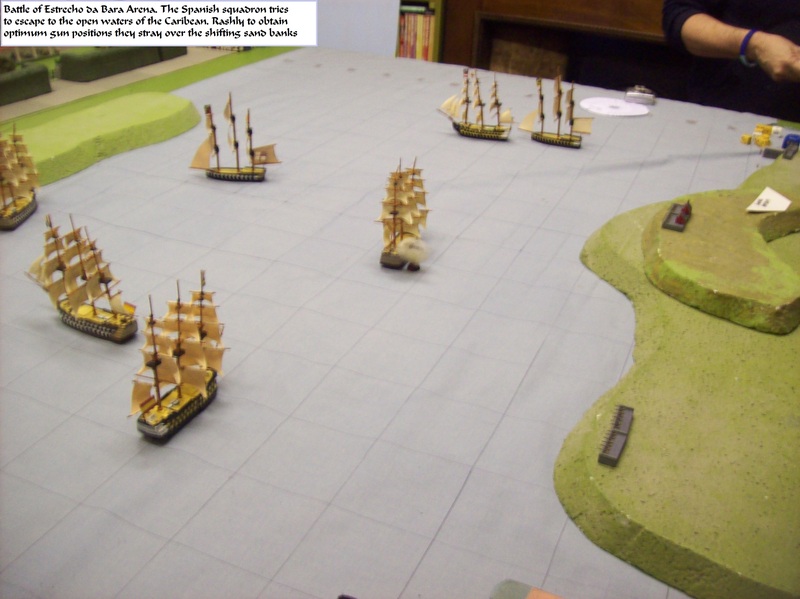 It was many years since we had played with the Napoleonic ships and the two Spanish players had no experience at all. The wind strength was diced for, coming up with a 3 on the AvD. 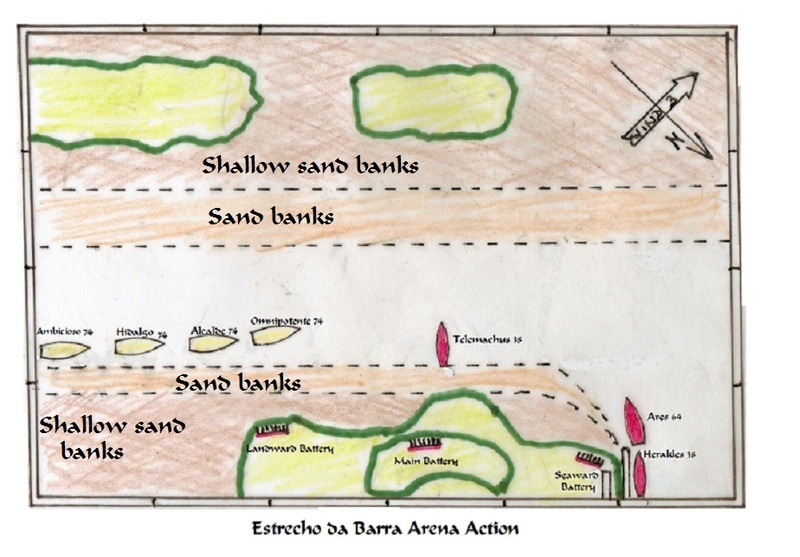 The plan shows the positions on move 4 when the red hot shot of the main battery was still heating up. The Main Battery did not fire until it was, so as to benefit the most from the first broadside bonus. I expected the Spanish to head directly along the Straight but desiring to get their guns bearing earlier both the Omnipotente and the Hildago veered Westwards over the shifting sandbanks. 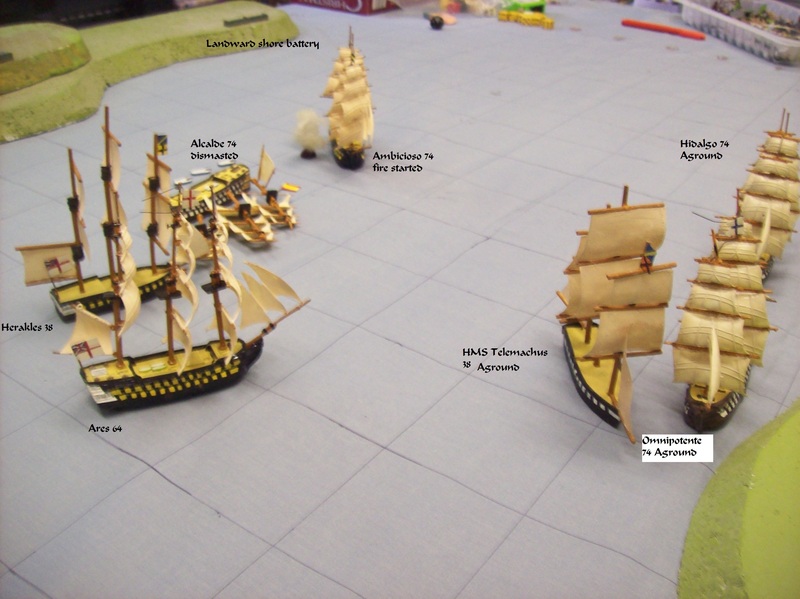 The blocking Frigate HMS Telemachus followed them. Hoping to dismast the fugitive ships the British mostly fired dismantling shot. This eventually completely dismasted the Alcalde whose demoralised crew took to their three remaining boats. 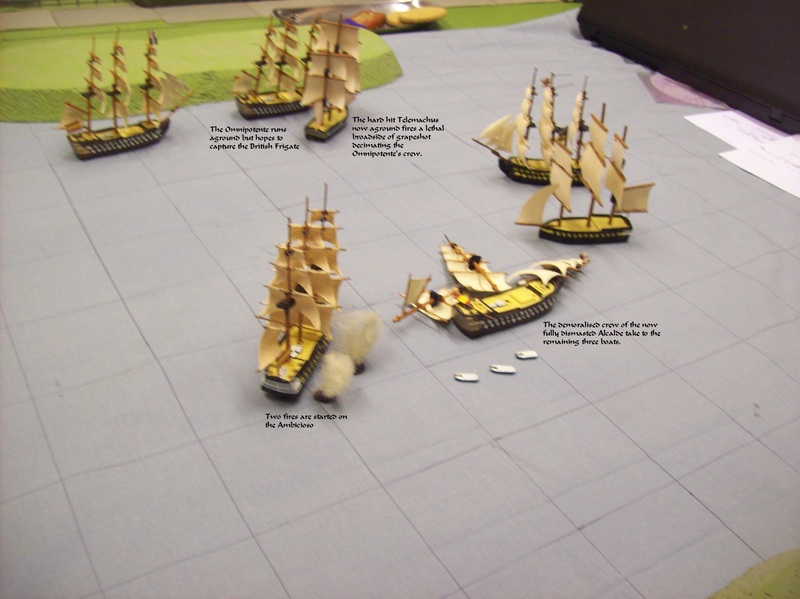 The Spanish used round shot fired low and almost silenced the Landward Battery with four successive broadsides. Although the Frigate Telemachus was about to be overwhelmed by the Omnipotente she fired a final broadside of grape. Both ships ran aground negating the expected boarding action. The Hildalgo behind the Omnipotente also ran aground. 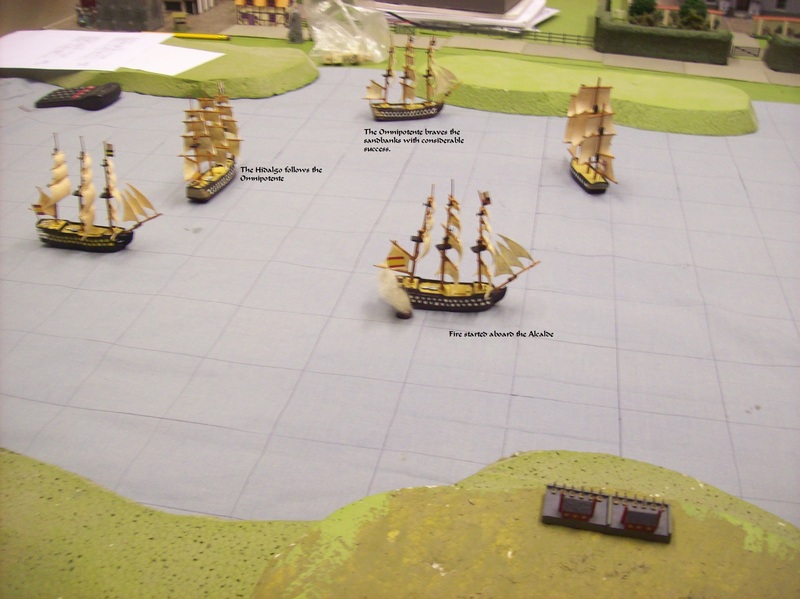 The red hot shot of the Main Battery started two fires aboard the Ambicioso and at this stage players had to leave. It was possible that the fires on the Ambicioso could be extinguished and that the two grounded ships could break free but the Frigate HMS Telemachus about fire another broadside of grape in the hope of causing sufficient casualties to force a morale test. 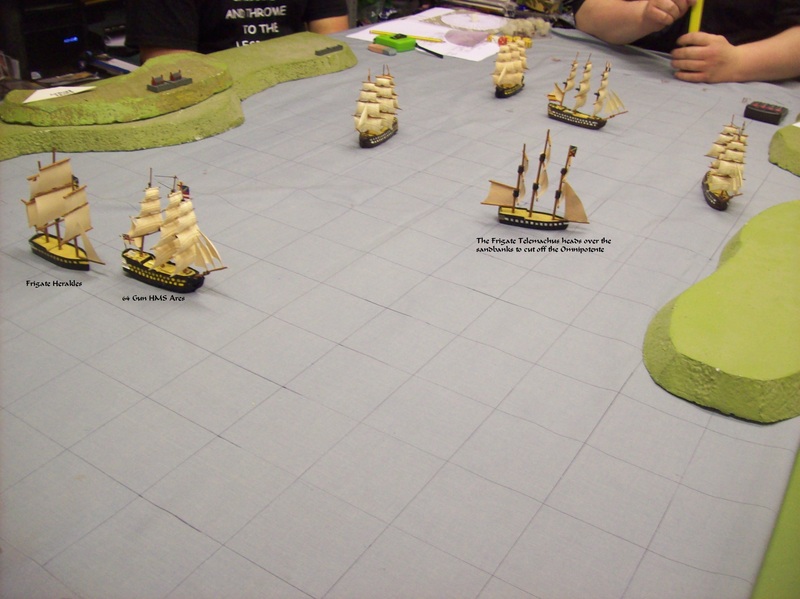 By this time HMS Ares and HMS Herakles were coming up in deep water supported by the Main and Seaward Batteries which were unscathedand still in action to engage the Ambicioso. It was declared a British victory. 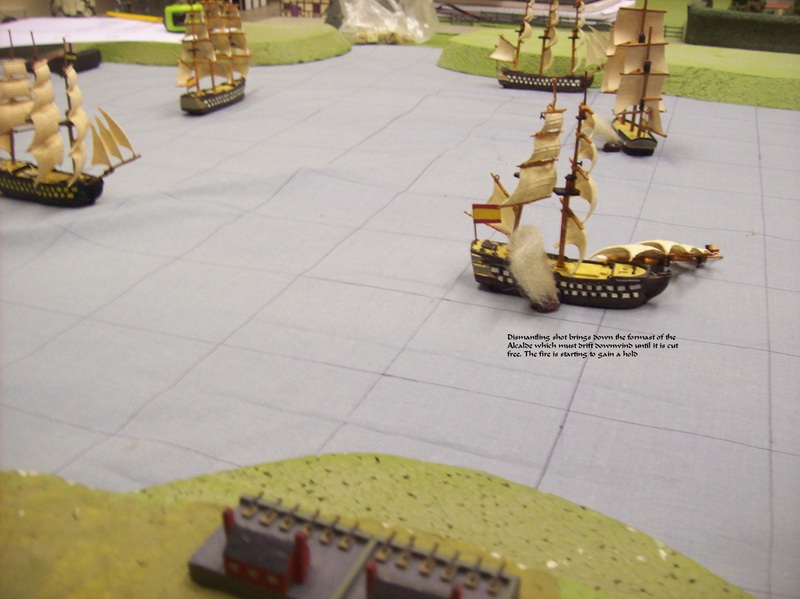 In fact since the wind direction was against them returning the Spanish would almost certainly have lost all their ships. The Captain of HMS Telemachus who engaged the superior enemy with panache and vigour in the Best Traditions of the Service with his Frigate to stop two Spanish Ships of the Line is highly commended and letters despatched to the Admiralty recommending promotion to Captain one of the captured Spanish Prizes.